The Summer Olympic Games in Rio are now over but from September 7-18, the Paralympics will be taking over the world’s sports spotlight. Of course the financial crisis for Brazil is continuing and on August 31 the Brazilian senate finally impeached elected president Dilma Rousseff. Yet in spite of earlier grumblings that the Paralympic Games would be cancelled, it appears they will go forward after all. These recent games have been fraught with problems that are not tied just to Brazil. They shed light on the growing concern expressed by a number of potential future host cities. The money required to hold the games is already obscene and the oft-used response that the games bring in money to cover those expenses has been proved false time and time again. Pictures of the wonderous “legacy” projects from many of the Olympic host sites for both the summer and winter games, including the 1936 German Games up through recent ones show expensive one-time-use facilities in abject ruin. Although always intended to be converted into post-game use for the host country’s citizens, few of them ever make the required Cinderella transformation. To build the sports equivalent of Camelot every two years to provide us with that “one shining moment” – the grand spectacle of the world’s elite Olympic and Paralympic athletes competing in high-powered performances for those few precious days – drains even the wealthiest bank accounts. David Goldblatt, author of “The Games: A Global History of the Olympics,” has written perhaps the best explanation of this change in support. Published in Quartz, a magazine covering the new global economy (http://qz.com/748894/nobody-wants-to-host-the-olympic-games-anymore-can-you-blame-them/), it was written just prior to the Summer Games in Rio. He uses the city as his example, saying that what happens after the cameras and athletes leave the Olympic village in Rio will be totally different from the televised version of the city. Listing Rio as a “disastrous model of urban development and planning,” he says it’s a “disaster 30 years in the making.” Rio, he maintains is like almost all prior host cities and won’t see any real rise in “growth, employment, wages or tourism. Instead, the new infrastructure and housing left behind in host cities are “overwhelmingly focused on neighborhoods that are already super wealthy.” Goldblatt lists the example of Olympic athletes villages that turn into expensive gated communities or, as in Athens, that turn into a poverty-stricken ghetto. In cities big enough to handle such a production, there is very little available space to build. As a result, poor neighborhoods are targeted for demolition, often through forced evictions with massive displacement of residents into even worse conditions. 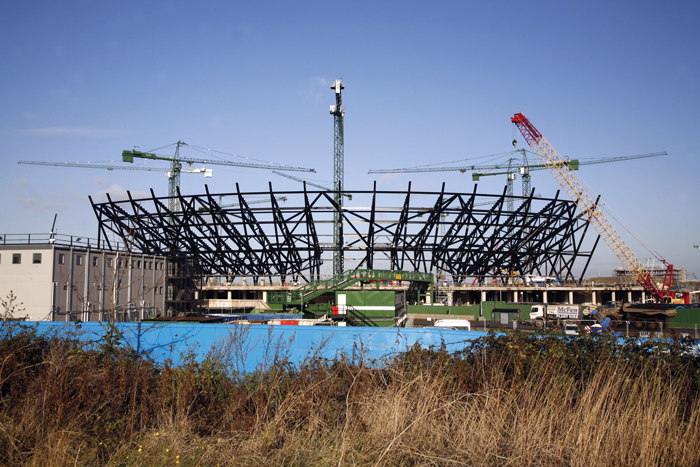 Much of the excessive and spiraling costs attached to hosting the games are also due to corruption in the host bidding process as well as the construction of the facilities. And don’t forget ugly nationalism in the form of propaganda, homophobia and doping schemes for a superior medal count as seen at the 2014 Winter Games in Sochi, Russia. There are many now calling for the Olympics to select a permanent site, maybe even in Greece to honor the origin of the games or elsewhere. Another option would be to use a network of cities globally that aren’t necessarily in the same country. Goldblatt says that there are many already demonstrated examples of ways that a smaller, more compartmentalized competition setup can work effectively. One such example is the World Cup that often uses eight-to-twelve co-hosts. A number of past host sites already have many of the geographic requirements for winter sports or for boating available with facilities already in place that can be a number of miles away from the rest of the celebrations taking place. There is a real concern that the Olympics may not survive long-term without some change, whether it’s a change of scenery or a change in the way the process is handled. We would like to know what you think needs to happen. Send us your thoughts at [email protected].